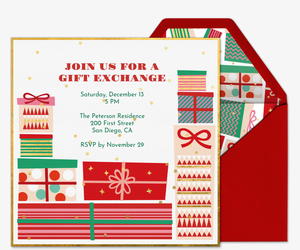 In the spirit of giving during the holiday season, organize a gift exchange between family and friends with Evite. No matter what kind of gift exchange you’re planning -- White Elephant, Secret Santa, Favorite Things, an office exchange, or one with rules of your own -- Evite can help you get all your guests (and their gifts) organized! 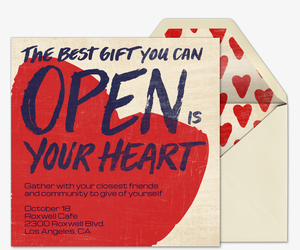 Browse dozens of free and Premium online invitations to get your gatherings started. 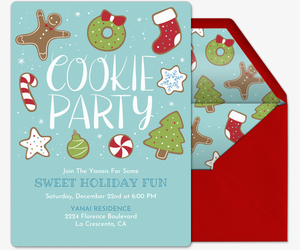 Customize your digital invitation to best fit your party plans. 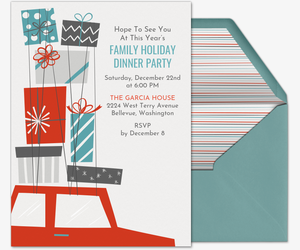 Coordinate with guests by adding a poll or a “What to Bring” list, especially for those potluck-style parties. Then, get guests engaged before, during, and after the event by sharing photos, posting comments, and more in your invitation’s paperless feed. You can also track RSVPs in real time, manage your guest list, send messages and event updates, and more. Make sure your party is a standout success with Evite Premium. 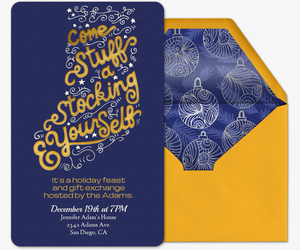 Our Premium invitations offer matching envelopes with custom liners and digital stamps, as well as optional inserts for extra messages and photos. Pricing is tiered based on the number of guests you choose to invite. Tie a bow on your party with tips from Evite Party Ideas. Start with our Top 5 Holiday Gift Exchanges guide to learn all about the most popular types of gift exchanges for friends, family, colleagues, or co-workers. Looking for something fabulous to enjoy with friends? Get inspiration from our Favorite Things party guide, or even our “Wine & Wrap” gift-wrapping party guide. 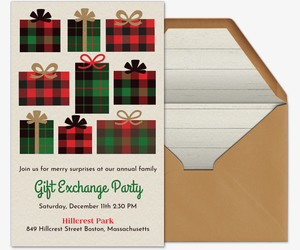 Trading presents at a different holiday gathering? 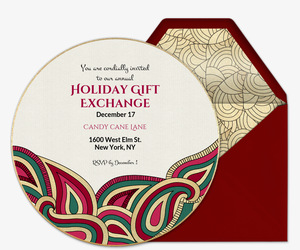 Browse hundreds of more designs in our holiday party invitations, office holiday invitations, Christmas invitations, Hanukkah invitations, and more. Celebrate milestones like birthdays, baby showers, and weddings with Evite, too.